The Socotra Archipelago lies 380 km to the south of Ras Fartak on the Arabian Sea coast of Yemen. 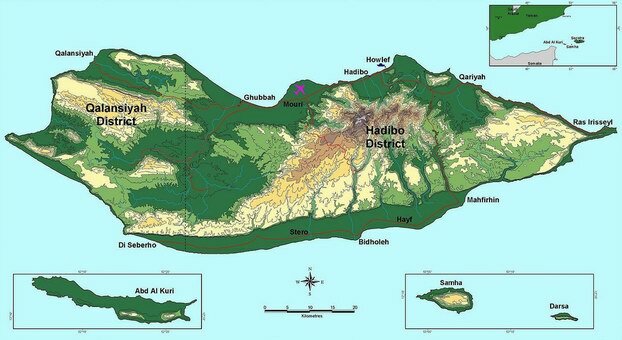 It includes a group of islands – Socotra, Darsa, Samha and Abd Al Kuri. 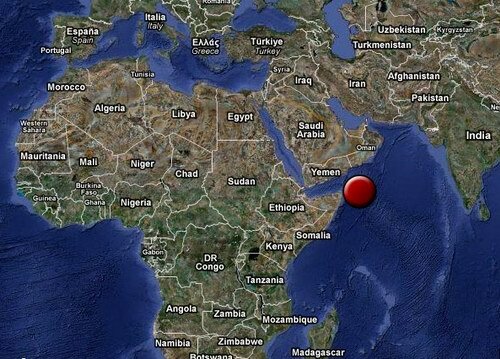 The western-most point of the Archipelago is just 80 km east of Cape Guardafui on the Somalia Peninsula. With a total land area of 3625 m2, Socotra is the largest of four islands. The eastern and central parts of the island are dominated by high mountain ranges with 1,570 m peaks and valleys providing green refreshing oases, sometimes hidden. Long ago the Socotra Islands were a part of Africa and Arabia, now separated by the Gulf of Aden. Its long isolation period lasted for at least 20 million years favored evolution and origination of new species. The Islands are a home to a great number of endemic species. All the land mollusks, 90% of the reptiles and a third of the plants can be only met in this area. Its population of endemic bird species is the biggest on the Middle East. Owing to location at the northwest part of the Indian Ocean, east of the entrance to the Red Sea, the Islands are inhabited by exceptionally great variety of fish, corals and other invertebrates carried here by major ocean currents from nearby and far away seas. The Socotrans are cheerful and self-sufficient people with optimistic attitude to life in spite of severe living conditions. They speak a unique classical Semitic preliterate language, Socotri, that is very different from modern Arabic. Isolated by seasonally bad weather and a lack of regular transport until recent years, the inhabitants of the Socotra Islands have not had practically influence from the modern world. 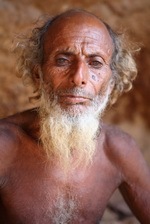 Therefore, for survival the Socotra people have developed deep respect and understanding of their land and sea. The Socotra Islands have global significance because of their evolutionary uniqueness, biological diversity and socio-cultural heritage. The Republic of Yemen with support of the United Nations and an alliance of governments implements a number of conservation and sustainable development programs, one of which is the Socotra Conservation Zoning Plan approved by the President of Yemen in 2002.The islands were recognized by the United Nations Educational, Scientific and Cultural Organization (UNESCO) as a world natural heritage site in July 2008. The European Union has supported such a move, calling on both UNESCO and International Organisation of Protecting Environment to classify the island archipelago among the environmental heritages. Tourism on Socotra is at its early stage of development. Every year the island is visited by not more than 3000 tourists on average, which is still environmentally friendly for the present. Socotra is a rather small island. It attracts people as a solitary place with rich landscapes not spoiled by the world progress. We do hope that at least in the near future Socotra will not lose its attractiveness because of its increasing popularity among tourists. However, we have to state that today already many popular camping sites have been spoiled by the tourist flow. Socotra turns into a well-known and loved place. But you have to get clear understanding of the island visiting format, its living and food conditions before coming here. We have pleasure to offer our guide services to those who want not only to take a rest on Socotra, but also to remember it as a Dream Island. We arrange tours on Socotra in cooperation with the local guides having many years' experience with tourists from various countries. They are highly professional and can show you the most attractive places of island, tell about its nature, language and culture, as well as organize diving, trekking or special programs. Our individual and group tours are developed to show you a great many interesting places that are not included in usual tourist programs and, that is why, have preserved their absolute purity. We take care of you during the whole trip with paying special attention to food arrangements. My trip to Socotra was from December 27 to January 8, 2014 and it was absolutely fantastic!!! It was a trekking tour with some days of rest near the sea or in the sand dunes. I was really amazed how well everything was organized. When we arrived at the airport the jeeps were already waiting to take us to Detwah bay where we put up our tents and went for a walk along the beach. When we returned the organizers (Anna and Denis - very friendly and knowledgeable young people) had already unloaded the gear and had cooked dinner for us. Next morning Denis and a local fisherman took us for a 5 - hour trekking tour in the mountains nearby: the views were absolutely stunning, the experience great and the scenery spectacular. Observing the coastline from the top of the rock I couldn't spot any evidence of civilization: no houses, hotels, cars etc. Very untouched nature. On our return all the tents had been packed and the jeeps were ready to take us to the village of Qalansyah, where the boats were already anchored waiting for us (again, super organization). The boats took us to an isolated Shuab beach, where we stayed for 3 days, enjoying trekking outings in the area (including the magnificent Lost World spot), swimming in the ocean and freshly caught fish for dinner (one of our team had brought a fishing line with him). After the Shuab experience we had a three day crossing of Haghyer mountains with night campings in very spectacular areas. Our heavy stuff (food, gas stove, tents, personal things) was carried by camels and the guys "operating" the camels were very friendly, professional and nice to deal with. To my surprise, the heavily loaded camels found trekking along the stony unstable paths a piece of cake :-) And again Denis cooked and took good care of us. It is necessary to comment on the character of the folks that live in Socotra. One would probably expect people to be a bit pushy, imposing and trying to sell you something as in some other countries of the Arab world but IT WAS ABSOLUTELY the opposite: very quiet, modest and nobleI and I must emphasize that the islanders are so genuine, so trusting, so independent. They most definitely are an "icing on the cake" of my trip. Anyway, within those 3 days we covered the Dragon tree forest, dropped in on an old Dragon's blood seller, swam in a freshwater canyon (twice in different areas), bought some papaya from a random passer by and I was even treated with some goat milk by a boy milking his goats in the mountains where they grazed. We ended up in a village, where we stocked up on bread and were taken by car to the sand dunes of Stero. Within the next 2-3 days we have walked and sandboarded on different dunes and it was AN experience!!! Between those we hiked to Hoq cave which proved to be huge and having curiously shaped stalactites and stalagmites of different color. On our final days we had a more relaxed schedule - no exhaustive trekkings, but just chilling on the beach or trying to catch an eel from a freshwater creek. Anna and Denis were always there for us, became our friends. We had nice chats after dinner looking at the stars falling from the sky and just enjoying the night. They told many stories about the island and the people, their traditions, culture... Very knowledgeable couple indeed.